LOS ANGELES -- A truck apparently lost its brakes on the big Grapevine downgrade into the Central Valley on Wednesday, causing as many as 11 collisions and injuring as many as 27 people. The truck left a 1-1/2-mile-long series of wrecks behind it as it descended into the San Joaquin Valley at high speed, down a steep grade where trucks are limited to 35 miles an hour, CHP officials said. Cars may have been slowed or stopped for heavy fog that has socked in the Valley. Visibility at the time was reportedly limited to several hundred feet. Twenty-seven people were hurt, but only 11 needed hospitalization, and four of those people were hurt badly. The victims were taken by ambulance up the hill to Fort Tejon, where medical choppers could land in bright sunshine at the higher elevation. 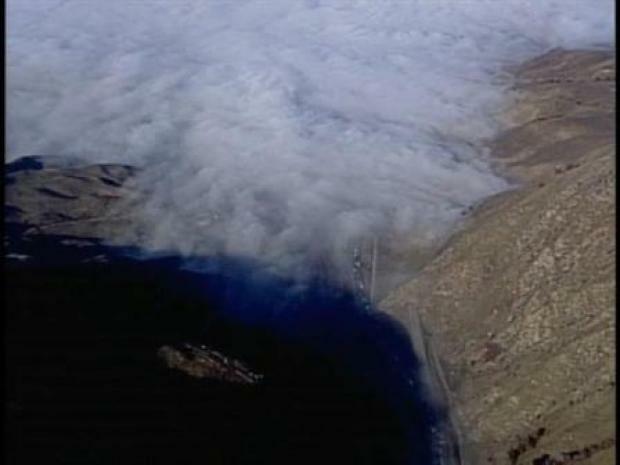 Heavy fog covers the grapevine, preventing rescue crews from flying to the scene of a car crash. The heavy fog at the crash scene prevented rescue helicopters from landing near the mess. The collision was reported north of Fort Tejon near the truck escape ramp at 12:52 p.m., said California Highway Patrol Officer Scott Jobinger, a California Highway Patrol Traffic spokesman in Fresno said. Los Angeles County Fire Department Inspector Ron Haralson said that there were no fatalities. Some of the injured were flown by helicopter to Providence Holy Cross Medical Center in Mission Hills in Los Angeles, a CHP spokesman in Fresno said. The crashes left the four-lane freeway northbound into the San Joaquin Valley closed for almost four hours, with an eight-mile line of stopped traffic stretching past Fort Tejon and Lebec. Northbound motorists were diverted east at Route 138 and told to take a 50-mile detour through Lancaster and Tehachapi. Many of the detoured cars ran into pea-soup conditions on Highway 58 in the Tehachapi, CHP dispatchers in Bishop said.